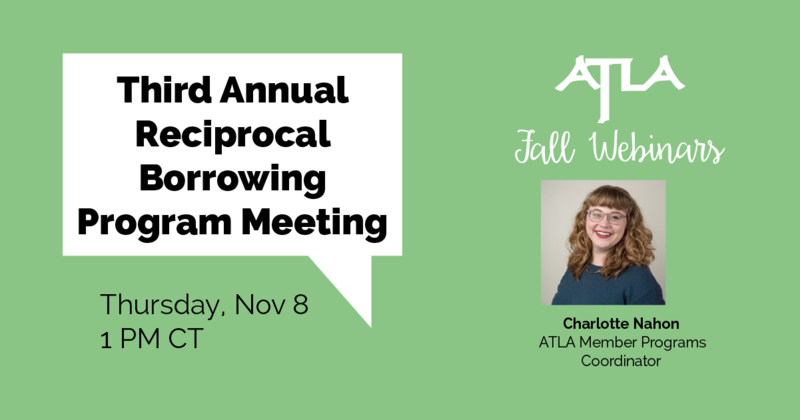 Charlotte Nahon, ATLA Member Programs Coordinator, will be leading the meeting. We welcome questions from participants – contact us at memberrep@atla.com if there are any topics you would like to add to the agenda in advance of the meeting. There will be plenty of time for current participants to share their experiences, including providing feedback from patrons and examples of how you’ve created an awareness of the program at your library. Not familiar with the ATLA Reciprocal Borrowing Program? By joining the program, more than 90 ATLA members across the United States and Canada have agreed to grant check-out privileges to patrons from other libraries participating in the program. Visit the map to see what libraries are currently part of the program.